Article II of the U.S. Constitution twice imposes a duty of “faithful execution” on the President, who must “take Care that the Laws be faithfully executed,” and take an oath or affirmation to “faithfully execute the Office of President.” These clauses are cited often, but their background and original meaning have never been fully explored. Courts, the executive branch, and many scholars rely on one or both clauses as support for expansive views of presidential power, for example, to go beyond standing law to defend the nation in emergencies; to withhold documents from Congress or the courts; or to refuse to fully execute statutes on grounds of unconstitutionality or for policy reasons. (3) a duty not to act ultra vires, beyond the scope of one’s office. These three duties of fidelity look a lot like fiduciary duties in modern private law. This “fiduciary” reading of the original meaning of the Faithful Execution Clauses might have important implications in modern constitutional law. Our history supports readings of Article II of the Constitution, for example, that limit presidents to exercise their power in good faith, for the public interest, and not for reasons of self-dealing, self-protection, or other bad faith, personal reasons. So understood, Article II may thus place some limits on the pardon and removal authority. The history we present also supports readings of Article II that tend to subordinate presidential power to congressional direction, limiting presidential non-enforcement of statutes, and perhaps constraining agencies’ interpretation of statutes to pursue Congress’s objectives. Our conclusions undermine imperial and prerogative claims for the presidency, claims that are sometimes, in our estimation, improperly traced to dimensions of the clauses requiring the President's faithful execution. The truth is actually simple: For all practical purposes, and in most contexts, “republic” and “democracy” are synonyms. 1 The big difference is that the first comes from Latin and the latter from Greek. To say that the U.S. is a republic, not a democracy, is like claiming to eat beef and pork but not cows and pigs. Newly available net worth data from the Federal Reserve suggests that the “left-behind” contagion has spread to all Americans aside from the top 10 percent. 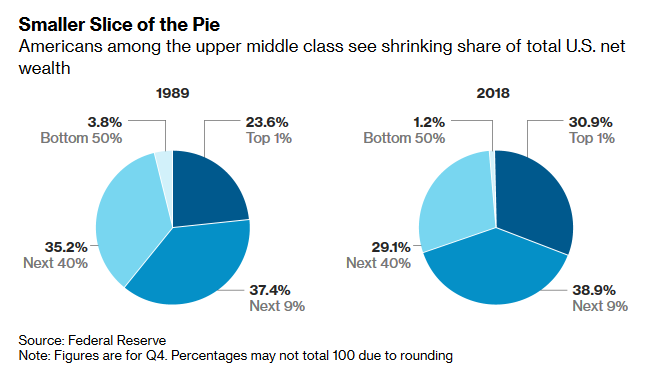 While still wealthier overall than most other groups, even the upper-middle class is feeling the pinch of income stagnation. The growth rate of this group’s incomes is lagging behind that of those both lower and higher on the socioeconomic ladder. The survey finds that Americans’ trust in the federal government remains at a historic low: Just 17% say they trust the government in Washington to do the right thing always or most of the time; 71% say they trust the government only some of the time and 10% volunteer that they “never” trust the government.